At Melanin Origins, we are more than just a publishing company, or a group of talented authors dedicated to providing the world with thought-provoking literature for both children and young adults. Our core values drive us to provide positive messaging for the black community, and stories with language that promote a common goal of educational empowerment, promoting strong families and understanding one’s own self-worth through culture confidence. Our focus is on providing young children a positive experience while learning about important black people in American history. We want them to not only learn, but be excited about and connect with the literature they are presented. 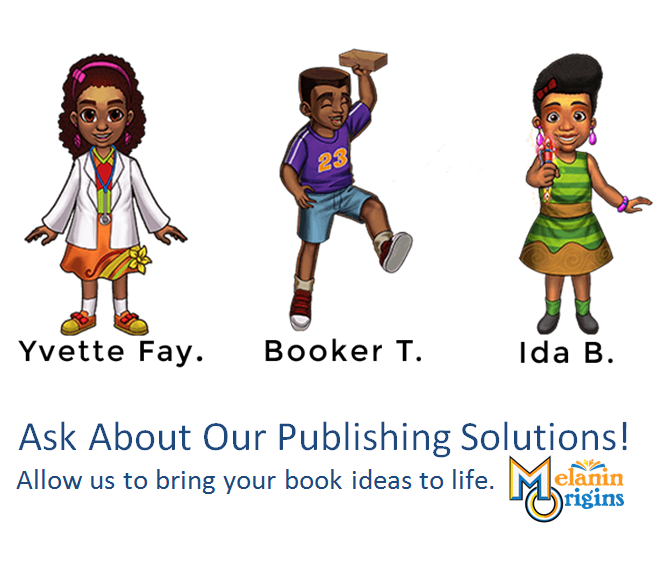 Partnering with talented African American authors makes it possible for Melanin Origins to provide the community with the best black books for children and young adults. Young children deserve to start their journey to learning about strong African American historical figures in a way that excites them. Melanin Origins children’s books are aimed at children in grades two and below, and places a strong focus on leadership, empowerment, history, great achievement and S.T.E.M. -- and it keeps the concepts fun and appropriate for the age group, leading to a stronger understanding of and connection to historical black figures in history. Watch this video to enjoy the sensational Louie T. McClain II further articulate the values of Melanin Origins and the importance of combating the concept of black inferiority in society through the telling of positive famous African American stories. BOGO All Year!!! : Receive your free copy of Brick by Brick: a Snippet of the Life of Booker T. Washington when you 1) Subscribe to our mailing list below and 2) purchase The Hero in The Helmet: Colin Kaepernick . Click HERE to learn more. ○ 2) purchase The Hero in The Helmet: Colin Kaepernick. View Louie’s video again on YouTube by clicking HERE. Learn how you can leverage the valued relationships Melanin Origins has built in the publishing community to self-publish your own black history literature book at a competitively-low cost! We understand the pride and fulfillment that comes with seeing your beautiful words in print and relish the opportunity to be part of this journey with talented authors providing the world with the best African American literature. Our black history books for children have changed the lives of so many youths and we look forward to helping you open the eyes of your readers and guide them in finding their own true reflection through your powerful words about untold black American history. Be sure to check us out on our Amazon African American bestsellers list to purchase your favorite Melanin Origins books and get a feel for what your creations will look like in print! If you are not ready to publish just yet, you can also join us a brand ambassador to immerse yourself in this competitive, niche industry. You will have the opportunity to discover up & coming authors, hidden black history, and earn extra income through publishing referrals, bulk book sales and curriculum sales. Not sure where you fit in yet? Check out our ongoing efforts in the community by following us on Facebook, Twitter & Instagram. We value the input of our fans and can’t wait to hear from you! Channeling The Greatness That Lies Within! We all have that one thing that makes us tick, and the great leaders in history are no exception. Your M.O. can guide you during the most incredible journeys you take throughout your life. Why not aim high and set yourself up for success in the beginning? We firmly believe that each child has a unique ability, embedded in their DNA, to pursue excellence and be great, however, so often children of color are taught who they are and what they believe through the eyes of those who’ve never experienced their journey. At Melanin Origins, we are taking back control of the narrative and we are changing lives in the process. We present true and important untold stories of black history about black people in American history who look like our readers, share their similar backgrounds, and who went on to make a lasting impact on the world. Learn more about how the world is embracing Melanin Origins and how you can too! Have questions? We’re happy to answer any questions you may have while exploring our website and choosing which books to purchase. Contact us HERE! Melanin Origins also provides special offers for our customers including publishing consultations and book bundles. See all of the Melanin Origins offerings from African American history writers HERE! When publishing a book, especially one that is both in what is considered a “niche category” but also equally important to the cultural growth and confidence of young children, project management is key. You need the right people by your side with the experience and drive to get your powerful words in front of the right audience. The knowledge, expertise and network that Melanin Origins has behind it can do all of this for you and more. Review our Price Sheet from trusted partner Jackson Publishing Co.
Get to know our Illustration Team. Learn more about our talented Melanin Origins authors. Order books and view our author’s gallery HERE. Become a Brand Ambassador. Everybody Eats! Our Author’s Gallery features first-class publishing selections from incredible African American authors perfectly tailored to excite and engage black youth. Our collection is not only a perfect sampling of black history month literature, it’s a library full of African American history books for elementary students, untold black history, African American history books for preschoolers, and picture books about black history. These stories are essential for our children to read and digest all year round. Finally, there’s a thought-provoking and inspiring way for our youth to learn about their heritage, history and culture! The Cool Genes series encourages young people to embrace what makes them unique and how they can achieve their accomplishments with the help of their cool genes! Members and fans of Melanin Origins come together to discuss the importance of providing children with a positive view of African American history through engaging reading materials. With a goal of becoming the largest Afro-centric book company, learn how the team is enforcing their core values and mission through bringing positive stories about black history to the forefront for children. Share this incredible video with your peers! It is our job as parents and educators to instill belief in our children early on so that they can have the confidence to act on those beliefs in a positive way as they grow. Melanin Origins produces books every African American should read. Share this message with the educators in your life! Sparking an interest in books and encouraging reading at a young age. Reviving the parent / child relationship through family readings, dialogue, discussion and debate. Instilling a pure, strong, healthy knowledge of self at a young age. Learn more about our core values, our mission and our position on race and how it affects the books we choose to publish HERE.